You can configure how your organization behaves in the organization settings section. You can find your organization settings by navigating to Account Settings > Your Organization. You can update your organization name on Your Organizations Settings page. Your organization name should be something that the members of your organization recognize. It will be used in member invitations and some of the reports. You can choose to be notified whenever a new member joins your organization. 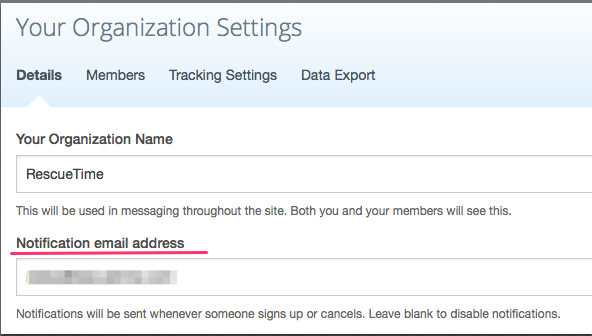 Just add your email in the "Notification email address" field on the main "Organization's Settings" page. You can leave it blank if you do not want to receive these notifications. By default, your organization can admit new members. If you get to a point where you do not want to accept any new members, you may freeze signups, and no one new will be able to join your organization. Please note that this applies to any outstanding invitations. To accept new members again, select Yes, allow new members. By default, RescueTime for Organizations includes aggregate, high-level reporting for your team. If you would like to disable this feature, you may do so on the Tracking Settings page in Your Organization Settings. You can toggle group reports on and off. Disabling group reporting is a good option if your goal is to give the members of your organization the personal productivity tools in RescueTime Premium. With group reporting enabled, you can choose a select group of "key tools" to include in the group reports. These should be the important tools that your team uses throughout the day. You can configure key tools by navigating to Account Settings > Your Organization > Tracking Settings. To add a new key tool, click Show key tools and then Add a new key tool at the bottom of the page. You will be able to select from a list of productive activities that you have logged. To quickly configure key tools, see the best practices for organization owners in the onboarding section.